The objective of this paper is to analyze different retrofit schemes of concrete members of a dual frame system with CFRP. This is implemented on a medium height reinforced concrete building designed prior to the seismic ductility provisions being added to the ACI code. Focusing on medium height concrete buildings allows the research to be adjusted and applied to a wide range of occupancy types. Pushover analysis was carried out to verify the response of the building is as expected and the modeling is accurate for the shear wall and moment frame systems. This was followed by a non-linear time history analysis to collect column rotation information. Fragility curves are developed to obtain statistical damage ratios under different retrofit methods. These curves show the improvement from each retrofit scheme and provide visual representation of the comparison to other retrofit methods discussed. Building retrofits are becoming more common, and even required in several cities including San Francisco and Los Angeles. Different methods include base isolation, passive dampers, and jacketing of structural members. Previous research found that retrofitting with Carbon Fiber Reinforced Polymer (CFRP) jackets provides the extra confinement needed for a column designed prior to seismic code requirements (Promis and Ferrier 2015). The extra confinement provided by the jacket allows the column to absorb a greater amount of energy and provides more ductility to the column and hence, to the structure (Binici and Mosalam 2007). Typical failure patterns consist of columns failing at the plastic hinge location, which develops due to a strong-beam, weak-column design condition. Failure of the columns leave no remaining load path to carry the structure and ultimately lead to collapse. Many instances can be found when examining the effects of the 1994 Northridge earthquake which left much of Southern California in ruins. The goal of retrofit is to force the beams to exceed full capacity before the columns by increasing the rotational capacity or ductility of the columns. When the beams fail before the columns, the failure method is ductile rather than brittle, and the building is in a better situation for people to evacuate, and for repairs to be done. Although steel and concrete jackets are also viable options to “enhance the overall structural seismic performance” (Ismail 2014), they require more effort for retrofit, more demolition to clear space for concrete forms or steel jacketing, and more manpower. These requirements negate the cheaper cost of these other types of retrofit and push engineers to research alternate methods such as CFRP. The objective of this research is, thus, to analyze different CFRP retrofit schemes of concrete members of a dual frame system. This is implemented on a medium height reinforced concrete building designed prior to the seismic ductility provisions being added to the American Concrete Institute (ACI) code. By using a common type of building with reinforced concrete members and a shear wall in the center, the findings can be quantified and applied to most medium height, dual frame systems. The main concern is not only the amount of improvement after retrofit, but more specifically, which members will provide the most improvement to the building earthquake response. The next section explains the column retrofit basics which is followed by the method employed in this study, presentation of the results and analysis, and finally conclusions and recommendations. The product of modulus of elasticity, rupture strain, thickness, and number of layers for the CFRP is compared to the product of unconfined concrete compressive strength and the radius of the confined concrete section. Binici (2008) uses Fig. 1 to show the section properties of a circular column; the depth of the compression stress block is defined using θ, and assuming the cover is very small in relation to overall column diameter, it is assumed θ′ ≈ θ. These relationships are used throughout the derivations for the rectangular stress block parameter, depth of the compression stress block, and curvatures. Because it was Binici’s objective to “provide structural engineers with a tool for the quick preliminary design of CFRPs in column retrofits,” a series of steps was developed for the engineer to use, which are further detailed in Binici (2008). In summary, the steps include (1) estimating existing properties, (2) computing displacement and ductility capacities, (3) estimating displacement ductility demand, (4) estimating required curvature ductility, and (5) calculating required confinement. A typical medium sized, dual system reinforced concrete building is chosen to represent other similar buildings constructed before 1970s building codes. This building is modeled using SAP2000, a popular structural analysis program from Computers and Structures Inc. in Berkeley, California. Then, a series of retrofits will be modeled to observe the building response. The retrofits will consist of three layers of CFRP wrapping: (1) columns only, (2) beams only, and (3) columns and beams. To apply acceleration forces to the building, 22 earthquake records are uploaded to SAP2000 to be used in nonlinear dynamic analysis. The earthquake records are chosen from the ground motion database used in the FEMA P695 (ATC-63) report. These are referred to as the Far-Field Ground Motion Data Set and comprise ground motions that meet several criteria including a magnitude > 6.5, Peak Ground Acceleration (PGA) > 0.2 g, PGV > 15 cm/s, and Strike-slip or thrust faults. A summary of the PGA and PGV ranges used in the Far-Field records is given in Table 1. Result outputs will focus on the maximum story drift and will be used to calculate rotation of the column at each earthquake PGA. These rotations are compared to hinge rotation parameters obtained from HAZUS - a computer program developed by the Federal Emergency Management Agency (FEMA) to determine risk analyses on existing buildings - documentation relating to the amount of damage expected to occur for a given type of building and the given column rotation (FEMA 2012). Slight Structural Damage: Flexural or shear type hairline cracks in some beams and columns near joints or within joints. Moderate Structural Damage: Most beams and columns exhibit hairline cracks. In ductile frames, some of the frame elements have reached yield capacity indicated by larger flexural cracks and some concrete spalling. Non-ductile frames may exhibit larger shear cracks and spalling. Extensive Structural Damage: Some of the frame elements have reached their ultimate capacity indicated in ductile frames by large flexural cracks, spalled concrete and buckled main reinforcement; non-ductile frame elements may have suffered shear failures or bond failures at reinforcement splices, or broken ties or buckled main reinforcement in columns which may result in partial collapse. Complete Structural Damage: Structure is collapsed or in imminent danger of collapse due to brittle failure of non-ductile frame elements or loss of frame stability. Approximately 13% (low-rise), 10% (mid-rise) or 5% (high-rise) of the total area of C1 buildings with Complete damage is expected to be collapsed. After extracting maximum displacements, story drifts are divided by column length to calculate rotations. These maximum rotations will be related to the corresponding damage state and used to develop fragility curves. The fragility curve theory states that “it is possible to predict, deterministically, the level of ground shaking necessary to achieve a target level of response and/or damage state” (Mander 1999). The curve allows for data to be extracted and compared analytically to form valuable quantitative conclusions. The theory behind the curve is “if structural capacity and seismic demand are random variables that roughly conform to either a normal or log-normal distribution then, following the central limit theorem, it can be shown that the composite performance outcome will be log-normally distributed.” (Mander 1999). A log-normal distribution is used because all values are expected to be positive. The cumulative probability function is given by Eq. 2, where Φ is the standard log-normal cumulative distribution function; Sa is the spectral acceleration amplitude (PGA in this case); Sa,ds is the median value of spectral acceleration (PGA) at which the building reaches the threshold of damage state, ds; and βds is the normalized composite log-normal standard deviation (FEMA 2012). 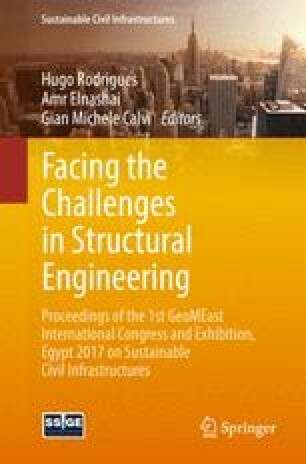 It is noted that “Structural fragility is characterized in terms of spectral displacement and by equivalent-PGA fragility curves for buildings that are components of lifelines”. FEMA also explains that damage state medians are developed using functions to describe not only the drift at the damage state, but also variability in the capacity curve, demand spectrum, and the threshold of damage itself. First, damage state drift ratios are converted to spectral acceleration using Eq. 3, where δR,Sds is the drift ratio at the threshold of structural damage state, ds; α2 is the fraction of the building height at the location of pushover mode displacement; and h is the typical height, in inches, of the model building type of interest (FEMA 2012). To account for variability, FEMA used Eq. 4 where βSds is the log-normal standard deviation that describes the total variability for structural damage state, ds; βC is the log-normal standard deviation parameter that describes the variability of the capacity spectrum; βD is the log-normal standard deviation parameter that describes the variability of the demand spectrum; βM(Sds) is the log-normal standard deviation parameter that describes the uncertainty in the estimate of the median value of the threshold of structural damage state, ds (FEMA 2012). “The variability of building response depends jointly on demand and capacity since capacity curves are nonlinear. The function “CONV” implies a complex process of convolving probability distributions of the demand spectrum and the capacity curve, respectively. Demand spectra and capacity curves are described probabilistically by median properties and variability parameter, βD and βC, respectively” (FEMA 2012). FEMA uses these median values and variability to develop median values of drift, displacement, and acceleration for a particular damage state to occur in any of more than 36 different building types. The fragility curve theory was verified by Mander (1999) using empirical evidence. The data is entered into Matlab as PGA and True/False values and the equation parameters are computed by a developed programming code. The curves are plotted in Matlab, then the PGA corresponding to 50% chance of a certain damage state occurring is used to compare different retrofit methods and overall feasibility of each method. This will quantitatively show a relative improvement from one retrofit method to another. Modeling Geometry: A medium height reinforced concrete building is modeled as a dual system frame in SAP2000. The configuration of the building is generic to allow for application of results to many sizes and shapes. The building has 4 bays in each direction, and shear walls at the center. All frames are reinforced concrete moment frames. The building is six stories above grade, which is an important consideration, since FEMA considers a mid-rise reinforced concrete building four to seven stories typically. Columns and beams are modeled to encapsulate design conditions prior to seismic code provisions were introduced. The columns are designed using ultimate moment and axial force given from SAP2000. Initial reinforcement was chosen from the Concrete Reinforcing Steel Institute (CRSI) Design (CRSI 2002). Cross-sections of the column and beam are shown in Fig. 2(a) and (b) respectively. The design is validated with moment, shear, and axial capacities given for the chosen design. It’s determined that 4-#5 bars would be sufficient in pre-1971 design for longitudinal reinforcement of columns (Iacobucci et al. 2003). To simulate a worst-case scenario, they have #3 ties spaced at 18 in on center. The beams are also designed according to the CRSI Design handbook with max shear and moment values from SAP2000. They consist of 4-#9 bars and #3 ties at 12 in on center. As for the shear wall, the 6” wall has no openings for modeling simplicity, and is modeled as unconfined concrete in the center two sections with ρ = 0.4% and boundary elements at each end with confined concrete and ρ = 3%. The boundary elements are 4 ft long and used to carry tension forces developed as the building tries to overturn. This configuration ensures the majority of structural failures are focused in the outer bays of the building. The shear walls are assumed to remain in the elastic region, and any hinges that may form are neglected. Retrofit Model: Typical CFRP retrofitting consists of wrapping deficient structural members with a fiber and matrix composite material with the fibers aligned in the transverse direction of the column. This is because fiber composite materials have their greatest strength in the longitudinal direction. Columns are usually wrapped at each end where the plastic hinge is assumed to form; this is to provide additional confinement (Iacobucci et al. 2003). By increasing the steel in areas where the plastic hinge doesn’t typically form, the stresses are focused on the composite material and the potential for error is controlled. This is important when considering that design calculations for a retrofit use strain compatibility to find capacity of the retrofitted section. By localizing the stresses where they are assumed to be, the strain compatibility analysis could be performed more accurately. The retrofit scheme chosen for the column only condition consists of wrapping the first three stories of columns with CFRP material. This is common, as story shears decrease with each successive floor in the building and less force needs to be dissipated. It is less common to need to retrofit beams in a building for seismic purposes, this is perhaps more common for instances when the loading conditions change considerably years after a building design. Unlike column retrofits, fibers are generally aligned in the longitudinal direction of the beams. This is due to the orthotropic material properties of fiber composites; they are strong in tension and are used to supplement tension forces in steel reinforcement and thus increasing bending capacity. The chosen beam retrofit scheme consists of wrapping the first three stories of beams similar to the column retrofit scheme. This is chosen to have an equal comparison with the column retrofit, and will be important when comparing the effectiveness. The last retrofit scheme consists of wrapping beam and column elements. This is done working from the beam retrofit condition, and adding one floor of column retrofit on the fourth floor. CFRP material properties for this research follow the “Analysis and Performance of Fiber Composites” book, which proposes typical properties for commercially available CFRP (Agarwal and Broutman 1990). Details of the retrofit are shown in Fig. 3, and material properties are input into SAP2000 one at a time to ensure composite action is accounted for properly. Defining properties for a material consists of selecting a specific material, then selecting general material orientation, lastly the specific material properties are defined (i.e. Young’s and shear moduli, Poisson’s ratio, temperature coefficients, and nonlinear stress/strain properties). First, confined concrete is defined using Mander’s model for confined concrete. An important note here is the modification of the stress/strain data to prevent the concrete from carrying any tension. All other data for the concrete is standard for Mander’s model confined concrete and typical moduli and weight parameters. The next step is to define the rebar; the most important note when defining the steel reinforcement is, when selecting the material type, to choose “rebar” which automatically selects the uniaxial material direction property. The last material to be defined is the CFRP wrap; this material is defined as an orthotropic material which prompts additional options in SAP2000 to define separate material properties in the longitudinal and transverse directions. The weight has been neglected because relative to the concrete beams and columns, the CFRP wrap adds very little weight. The stress strain curve used is from Agarwal’s text, Analysis and Performance of Fiber Composites, showing typical properties of commercial composite materials. When considering all materials interacting together, the stress-strain can be approximated similar to Fig. 4. Shown, is a standard model for unconfined concrete, confined concrete, and confined concrete with CFRP wrap added. This graph clearly shows the extra strain capacity allowed by the CFRP. The confining stress provided by the CFRP wrap allows the concrete to stay intact and reach full capacity without bulging out the sides of the column. With all individual materials defined, beam and column cross-sections can be created. For the existing building, it is just a matter of defining typical sections. SAP2000 allows for defining cross-section primary material, as well as separate reinforcing material. The reinforcement layout for the existing building’s beams and columns are shown, as defined, in Fig. 2. To model the retrofitted beams and columns, SAP2000 Section Designer is used. SAP2000 Model: Loading conditions are crucial when performing nonlinear analyses on a structure. The first load applied is the dead load and is only the structure weight in the Z-direction. The next analysis performed is the modal analysis where SAP2000 computes modal frequencies and mode shapes for the structure. Pushover analysis follows, and is a crucial element when verifying nonlinear structure response. Pushover is defined as nonlinear and using stiffness from the end of the dead load case. Using this stiffness should provide more accurate results in terms of nonlinearity. Pushover results are also used to provide a preliminary visual verification of the modeling of the building. If deflections are out of the ordinary for the existing building case, there are issues in the structure modeling. Pushover results are taken for all four building cases. The pushover for an existing building, shown in Fig. 5(a), shows a typical deflection pattern for a reinforced concrete building. Visually, as story shears add toward the bottom of the building, the first floor takes the total base shear and forms collapse hinges in the columns. It is visually clear by the hinge rotations, that this building has the opposite of the desired Weak Beam Strong Column condition. The column hinges have exceeded their capacity to a higher degree than the beam hinges. The next case is the column retrofit. The pushover analysis results for the column retrofit condition are shown in Fig. 5(b). The improvement from the retrofit is immediately noticed in the first floor columns. The columns still hinge, which is normal, but they withstand much more rotational capacity and remain in the Immediate Occupancy hinge region defined by FEMA. Figure 5(c) shows the pushover results for the beam retrofit condition where it is noticed that retrofitting the beams increases the stiffness on the first three floors so much that the base shear is essentially carried to the fourth floor. This creates the opposite of a soft-story condition and could put the columns in upper floors at increased risk of collapse. Finally, the beam and column retrofit pushover case in Fig. 5(d) shows a great increase over the beam only retrofit case. This is demonstrated by the hinge rotations at the fourth floor being reduced from Collapse level to Immediate Occupancy. The last loading condition applied to this model is the Nonlinear Dynamic Time History Analysis (NDTHA). A NDTHA can be done in two ways by SAP2000. The first is through the direct-integration method, where “equilibrium equations of motion are fully integrated as a structure is subjected to dynamic loading” (Abell and Kalny 2013). Analysis involves the integration of structural properties and behaviors at a series of time steps which are small relative to loading duration. The equation of motion under evaluation is given in Eq. 5, and it is noted that integration is performed at every time step of the input record, regardless of the output increment. The model building for this research was subjected to this analysis for one earthquake case as a test. The total analysis time for the NDTHA alone was almost two and a half hours and the results were almost indiscernible from the second method known as Fast Nonlinear Analysis (FNA). FNA is defined by Computers and Structures, Inc. as “a modal analysis method useful for the static or dynamic evaluation of linear or nonlinear structural systems. The efficiency of FNA formulation is largely due to the separation of the nonlinear-object force vector RNL(t) from the elastic stiffness matrix and the damped equations of motion, as seen in the fundamental equilibrium equation of FNA” expressed here in Eq. 6. The next step is to define and apply the FNA load cases to the structure. To apply these forces to the structure, they are defined as nonlinear dynamic load cases using modal history. The most important factor when defining these cases is the scale factor which is needed due to the time history record being in units of ‘g’ and SAP2000 needing the units in inch/s2. The scale factor is calculated as in Eq. 7 where X is the desired acceleration and PGA is the max value of the time history record. Other important factors are the number of time steps in the record and the time increment they are spaced at. After saving all records in SAP2000, there are 22 nonlinear dynamic load cases. Because these earthquake records range from 0.15 g to 0.73 g, and a wider range would present more well-rounded data for the fragility curve analysis, three records were chosen to scale down to 0.1 g, up to 1.0 g, and up to 1.5 g. This will round out the data collection and total to 31 load cases to be applied to the structure. To choose the three earthquake records to scale, it is important to use the time history spectra shown in Fig. 6 to choose records that will apply different forces at different time periods. The chosen records and scale factors are shown in Table 3. These values are added to the SAP2000 model already containing the original 22 earthquake records to make 31 total records. Plastic Hinge Modeling: Material non-linear behavior needs to be considered in pushover analysis. SAP2000 can reflect the yielding and post-yielding behaviors of members using discrete user-defined plastic hinges in frame elements (or default hinge properties). Force-displacement or moment- rotation curve that gives the yield and post-yield values for resistance against the force and displacement can be defined for each degree of freedom. This procedure could be done by utilizing a curve similar to Fig. 7 with values at five points: A (the origin), B (the yielding), C (the ultimate capacity for pushover analysis), D (the residual strength for pushover analysis) and E (the failure) (Asaei, Lau, and Bunnori). Figure 7 also shows FEMA capacity points of the plastic hinge. The capacity points determine the extent of column damage relative to the hinge rotation, they include Immediate Occupancy (IO), Life Safety (LS), and Collapse Prevention (CP). “It is noted that analysis of sections through SAP2000 is adequately accurate. It must be considered that nonlinear behavior of concrete confined by CFRP is substantially different from that of simple concrete members. This difference is more considerable in post yield part of the stress-strain curve of concrete and consequently, moment curvature” (Asaei et al. 2013). The values of moment and curvature for the points A to D are obtained through sectional analysis using the SAP2000 Section Designer software. The moment vs curvature graphs for the columns are developed to show the quantitative difference between the existing columns and the retrofit columns. Using this data, a moment-curvature relationship is developed and input into SAP2000. For comparison purposes, the existing column and beam configurations were created in section designer and moment-curvature data was extracted. The retrofit columns have much more moment capacity at yielding when compared with the existing columns and can withstand much more curvature at a higher moment value. Figure 8 shows the comparison between the existing and retrofit column hinge properties. While moment capacity is improved, the increase in curvature capacity is apparent. Fragility curves are created in Matlab to visually show the improvement of the building from one case to another. Figure 9(a) shows the curves for the existing building case for slight damage, moderate damage, extensive damage, and complete damage. This figure clearly shows the probability of each damage state for an existing building from slight damage to complete damage. From this data, it can be inferred that there is an 80% chance the existing building will undergo moderate damage at a minimum. It is important to develop fragility curves showing all four damage states for each retrofit case. Creating these curves and examining the shape and value progression is another quality control check to ensure the data hasn’t been skewed and isn’t incomplete in any way. Fragility curves for the column retrofit, beam retrofit, and beam and column retrofit are shown in Fig. 9(b), (c), and (d) respectively. With fragility curves formatted comparing damage states for individual building conditions, it is also helpful to compare individual damage states. To do this, the same Matlab program was used to combine damage state curves from different building cases. These curves are shown for the slight damage, moderate damage, extensive damage, and complete damage states in Fig. 10(a), (b), (c), and (d) respectively. Reviewing these shows an even clearer picture of the relative improvement from each retrofit condition. It is noticeable for slight damage, every retrofit performs almost similarly, and all are better than the existing condition. For moderate damage, the average earthquake acceleration threshold is greatly improved over existing, but all cases would most likely undergo moderate damage for a PGA more than 0.6 g. The fragility curve for extensive damage also shows great improvement for all retrofit conditions over the existing building. Finally, the complete damage fragility curve shows improvement mainly for the column retrofit condition. It is observed that for a PGA of 2.0 g, the probability of complete damage with a column retrofit drops almost 20% from that of the existing building. Modeling in SAP2000, pushover analysis, and fragility curve analysis has shown clear improvements in each retrofit case. It is noticed in the beam retrofit cases that critical columns are moved to higher floors in the building. What the analysis doesn’t show, is these columns may have a smaller cross-section than columns on lower floors. These smaller cross-sections would have less moment-curvature capacity and could surpass the hinge level outlined in the pushover analysis, leading to full collapse of the stories above. It is recommended that this study would be further extended to include different numbers of bays in each direction and the number of stories be adjusted to include more building possibilities. Adding floors and/or spans will increase the weight of the building and subsequently, the seismic force applied to it. Changing the spans or story heights will change moment and shear forces on the beams and columns. The overall layout of the building could be altered as well. Different shaped buildings will apply the earthquake forces to different parts of the structure depending on the center of rigidity. It could also be extended to include other alternatives in terms of CFRP coverage, CFRP amounts, or FRP types.